One of the best things about Thailand is the rich food the country has to offer. One of the best dishes I have tried is called khao soi. It's a coconut-curry noodle soup, usually served with chicken. 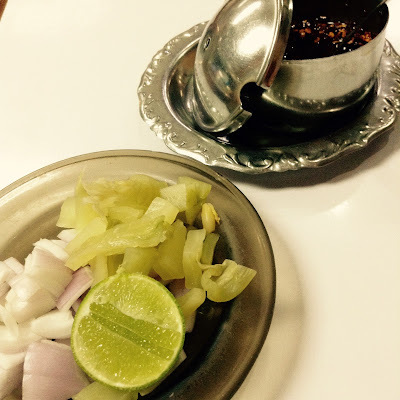 It tastes spicy yet sweet, is slightly creamy from the coconut, and it has many complicated layers of taste. The noodles are Chinese -- they're eggy, stretchy, and made of wheat. This curry is topped with a nest of crispy fried noodles and comes with a side of vegetables and chili paste that you can add to make it even more spicy. One of the most delicious dishes in the world. Mine came with a side of chili paste, raw onions, pickled onions, and lime. If you ever make your way to Thailand, this is definitely a dish that should be at the top of the list of new food to try. 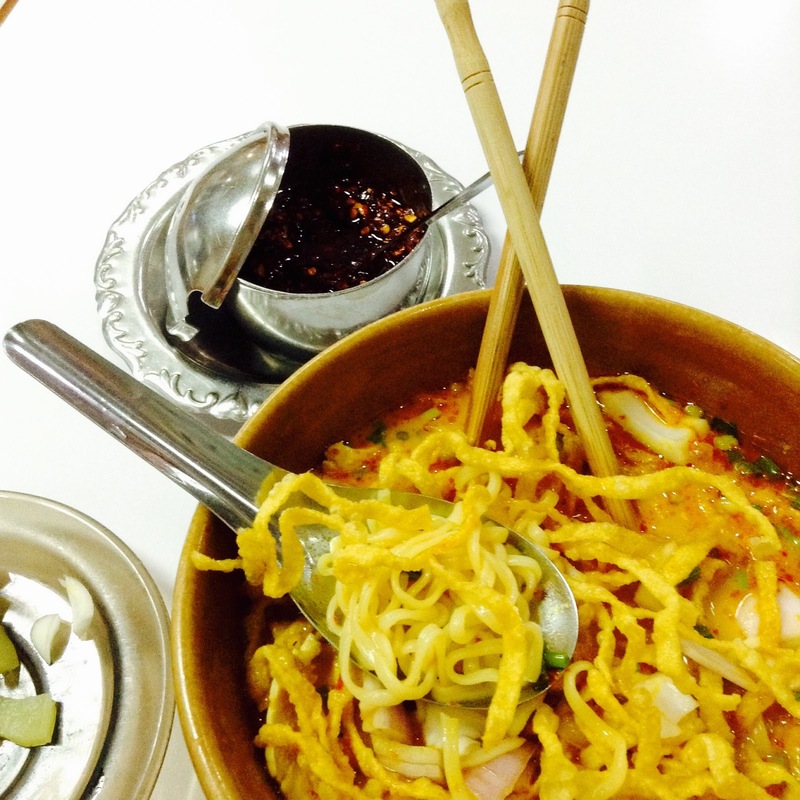 Khao soi is a spicy, creamy mix of flavors that will quickly get you hooked! The best place to find an authentic restaurant is in the north of Thailand, specifically Chiang Mai. In Thailand, it's typical for just a spoon and fork to be the utensils given out for any given meal. So you eat with the spoon in your dominant hand, fork in the other. You use the fork to put stuff on your spoon, then just use that to eat. 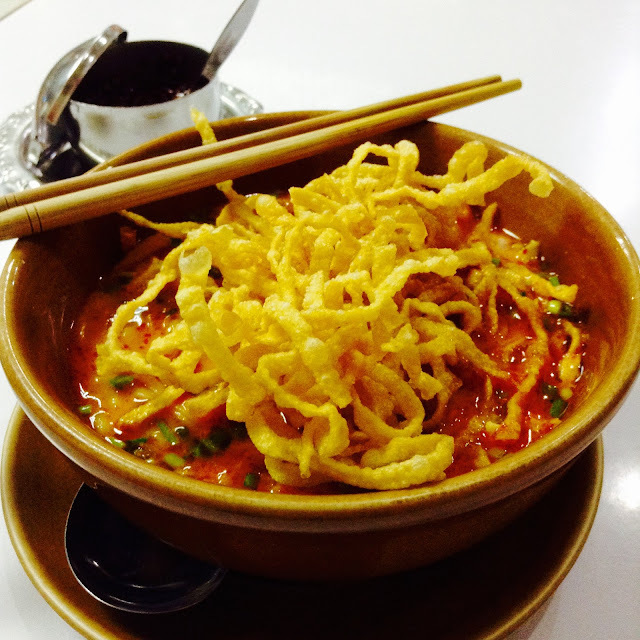 Khao soi, however, is served with chopsticks and a soup spoon. If you're not used to eating with chopsticks, this meal can get a bit tricky. So, you have to use the chopsticks with your dominant hand, and you use them to put some noodles and chicken and other stuff on the spoon. You then make sure there's a bit of broth on your spoon and shove it in your face because it's so delicious. If you can't easily maneuver with chopsticks, this meal can get quite complicated! It is so, so worth it though. I highly recommend eating this if you ever find yourself in northern Thailand!